Pics - "Drums in his Heart"
These are some pictures of some of the sets I've had down through the years, along with some old band pics, as well. The days of Ginger Baker. John Bonham, Ian Paice, Don Brewer, and a bunch of other 5 pc. players, like Buddy. Man, will Rich versus Roach spin your head while it spins on a turn table. Five drums sound like ten with those guys. But, time moves on. The days of Carl Palmer, as well as Billy Cobham. Man, I wish I never sold those gongs. Indeed, it took a long time to set up and take down and pack up and set up again .... my mother always said I should have taken up guitar. The bass drum is 24x26, btw. Packed quite a wallop. If you look to the upper right you'll see the cymbal tree I made. Kind of different for its day. I still have a few today. Just a cool sound. You know what the guy is thinking. "How does he play all this stuff?" Somehow I did. Every single piece. This was our first concert. They had a fit trying to mic everything. I think Kevin named me 'the Train.' I used to blow a train whistle at the end of my solos, before the final flurry. When I saw Charlie Adams do this on the Yanni video I thought, "Aha! Beat you by a couple decades, man." Charlie is a great drummer, though. This was our first concert. I wish I could find the pic of my mom standing on a chair clapping when the solo was done. She even collected tickets and money at the door that night. What a pip. Kevin loved the drums. Used to sit down and play them all the time. Try to, anyway. Isn't every musician a frustrated something or other? I am a frustrated keyboard player. I'd love to be able to play the keys. So, I took up mallets. Close enough for now. The Remo Legaros. They needed Evans oil heads to sound decent. But ... time moves on ... again, and always. Okay, so you get some shells, and lugs and hoops and heads and a little stain and finish and away you go. No looking back to Ludwig, or anybody else. The 26" bass was unreal. I ended up cutting it back to a 12" to go with a 'half tom' set I made, and have used that half-tom configuration for a long time now, though I went back to a normal bass size. This was my first one. Nervous as a cat. I hadn't played with sticks for months because of the neighbors, and only played with brushes. I grew to love brushes, but it sure made things weird to do this night. Went okay, though. My first entry into the half-tom concept, around 1995. I came upon this concept by accident, really. I had a 7x14 snare set up on a stand off to the side of the room. I happened to release some of the tension off the batter head. The strainer was down and when I hit the drum in passing I could not believe the tone and sustain. So, I cut down all the shells I had and was greatly pleased with the results. Best sounding toms I've ever made or played. They really sing. David VanDevander and Kathryn Frigon. First Night concert. Bone chilling cold. I thought the instruments would freeze solid when they got put back in the van. The wind chill. Inhuman. Interesting concert though. Some guy video taped it and it ended up on a television station for replay. Rachel Johndrow and Kathryn Frigon. Taken before a concert in Freeport, ME. I ended up selling this set to go electronic. The half-toms really 'sing' as the heads resonate, being closer together. Denise Hurd, Rachel Johndrow, Kathryn Frigon. This, like a couple other concerts, was performed in a gymnasium. The worst possible sound a band can ever regret putting out. I also regretted saying the sound was like a 'galactic toilet bowl,' which didn't go over very well with the audience. But that IS how it sounded that night. Another infamous gymnasium concert. This set was really nice, though. Italian Rosewood veneer. 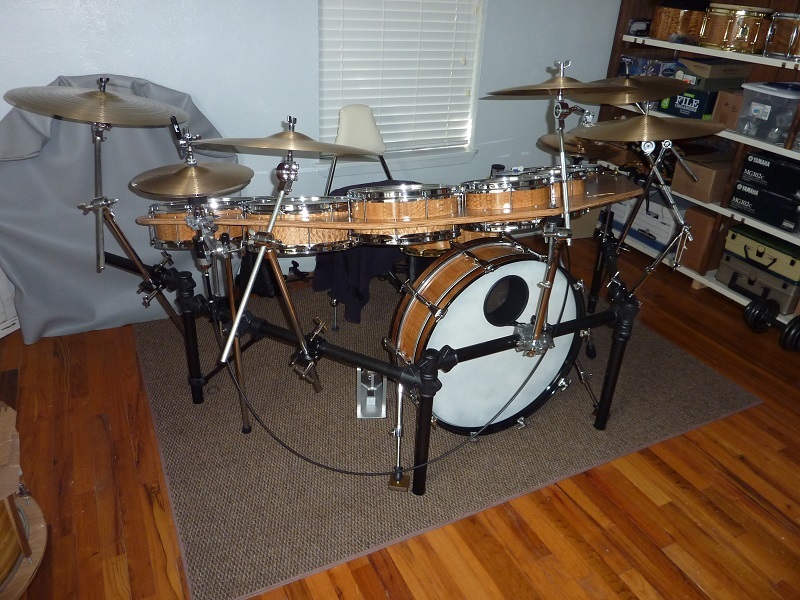 I've never seen floor toms in a half tom configuration, but I love the sound. Much cleaner than the typical deeper floor tom. I believe the difference in pitch is more defined. Low end notes all seem to garble together in typical set ups. The half-toms seem to be able to separate their sound field better. In this set the 20" floor is a 20x20. The current drum I use is a 10x20 mounted on a modified old Premier snare stand. The difference in sound is very noticeable. Well, this is what I got for selling my set. The TrapKat. A really fun device, but really, nothing can take the place of acoustics. On the other hand, an acoustic set cannot come close to everything you get with electronics. Hit a button, next set. Hit a button again, totally different sounds. Very cool, and for many reasons, including footprint, very practical. 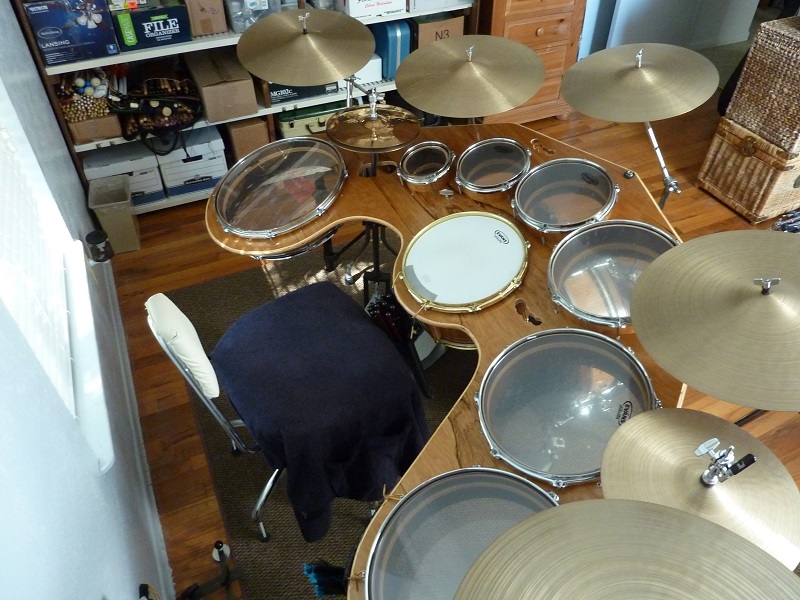 So, made another half-tom set, though not exactly the same as the Rosewood set. Made something I call "Pancake Drums" based on the look of Trilok Gurtu's set up. You can see the rack of 6" 'toms' in this pic, as well as barely make out the rack of 4-8" with a 6" in the middle, on legs, with the sleigh bells hanging off it to the right of the 10x20" tom. This set has a walnut veneer. My current set. I am thankful I didn't sell my cymbals. I renovated some low end drums given me by a friend into this set which I had while living in Texas, the other set in storage back East. No room for it in the house. I covered these shells, all from different manufacturers, in Mahogany veneer, both outside and inside. Some of the drums were pretty old and beat up, some were used and new, off ebay, all were basically student level drums (save for the aluminum shell snare I made), yet when finished, they sounded really good. It's always about head choices, and how you mount the drums. I've been mounting drums in snare baskets for many years, so they 'sing' nicely. Yeah, that's a 6x22 bass drum on legs in the back. Boom. Sold the set, along with my pancake drums, to a nice young guy who played at his church. When the next service came along and people walked in and saw all that stuff they freaked out. He sent me a pic of it set up. Wild. He did some cool things with the pancake drums. God's Bow of Promise. Coming soon. This will be the last set I make for myself. Over the years I have appreciated the beauties of wood grains and have left finishing shells to just natural gloss. This time I wanted color, and lots of it. And I wanted a set that brought God more closely into my thought process. Enter His rainbow, the bow of promise. There's more than seven drums, so I had to do some shading beyond the natural color spectrum. My first time dying shells, as well. Thus far, after ten coats of lacquer, I'm pretty pleased. Next is to cut the bearing edges and then put it all together. In working with wood to make stave shells and doing some reading I came to find out figured grains, at least in North American domestic trees (and I assume many others around the world), are caused by stress to the tree. Whether too much heat, too much cold, too much dry weather, etc., all these factors cause things to happen to the cell structure of the tree. The more stress, the more figure in the grain, the more beauty when the tree is cut down, sawed into boards or shaved for veneers to reveal it. This particular veneer is figured Eucalyptus. It has, not only a wild figure, but even within the actual sheets of veneer there was a lot of difference in patterns and intensity. Who could have thought such beauty existed in a tree? How could one know? It is rough and plain on the outside. But the Creator put that beauty there, allowed it to be so, year after year of tough summers, winters, and harsh growing seasons. For the Christian it is trials, tests, pruning of the life, difficult seasons of living which establishes a more beautiful character inside us when finished by the hands of the Master Craftsman. Is it any wonder Christ used the things of nature to explain and expound on His teachings? The new set is up and running. The camera doesn't get the full scope of the colors. Sure looks alot different with all the hardware and the rest of the set around it. This is a place where the Arbiter lug-less drum would be a great thing. Never could figure out why those drums didn't catch on. My first time using a rack. Makes things easier at the floor level - no tripods colliding, but otherwise a rack seems to require the same number of clamps, etc as I used before with just stands all over. It does have a more streamlined look. BTW, do they sound good? The sound great. Tuned up easy. Nice resonance and fullness, everything in really clean and harmonious tonal combination. I'm glad I went ten ply shells. For cymbals I tried to keep things close to my set ups I've had for years. A few changes. Not quite as many cymbals, but I've got the basic sounds I like for variation and "colors." Here's a shot which shows how things look for me behind the set. It's interesting how the maple interiors took the color dyes more accurately than the Eucalyptus veneer. Live and learn on that one. Back in my teen years my drums were set up in my parent's basement. One thing I had all around me, on the walls, were collages of drum pictures cut out from every magazine, posters, even record covers. Seeing all the different drummers with their sets, from all kinds of angles gave me constant inspiration and ideas for playing. I also rearranged cymbals almost back to an arrangement I played for years. Have to get my muscle and brain memory back into gear for it, plus what is different. My hands go places where nothing is. How strange is that? You just get used to doing things with your eyes closed. I must say, that 10x20 has been in a number of sets I've had and it has never sounded so good as with these maple hoops. Bravo, Jody! As you can see even though I scraped down the inside of each shell the past color, from the rainbow set, maintains some shadows. The dark walnut stain just wouldn't cover it totally. Actually, I don't mind. Reminds me of the idea I had for the rainbow set to begin with. But I really do love the maple hoops. I'm going to try some maple snare hoops Jody made, the 32 ply, on a wood snare shell and see what happens. I may even try them on the aluminum and see how it sounds. As you can see I even had enough leather left over to make a few sticks bags. The back side of this leather is just rough and rather colorless. But the tooling ... what a transformation. From a spiritual point of view, how can I not think of how God is able to take any person, the most corrupt, the most vile, the most hateful or angry soul and transform them into a citizen of Christ's kingdom. Inside they might have their defects, but the change, the glow in the countenance, the peace, the joy, the strength ... it all shows in that transformation of being born again, renewed in mind and actions, and the fit different people have into the family of God. Drums continue to speak to me, even when I don't play them. God is good. What you are looking at is something I call the Pancake set, or Table Top set. Another idea born of having my set in storage during a home renovation here in Texas. This is the second prototype. The first was smaller and each prototype keeps getting bigger. Pancake tom racks I had made for years and always wanted to try a whole set. Single headed toms - 6,8,10,12,13,14, 10" snare, 18" kick. A lot of fun to play. Here I just painted the 1.5" shells with hammered copper spray paint, and did the frame in a black hammered spray. In the corner you can see a 13" Pancake tom I've had since the 90s which I had hooked up to a kick pedal. The layout left room on each side of the snare for a couple small x-hat combinations. 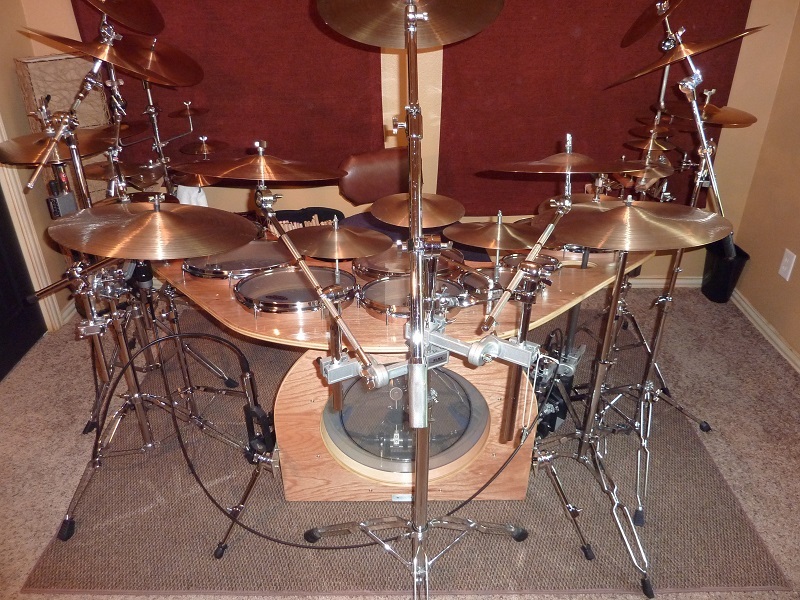 The whole thing just mounts on the snare stand, and two small cymbal stands. 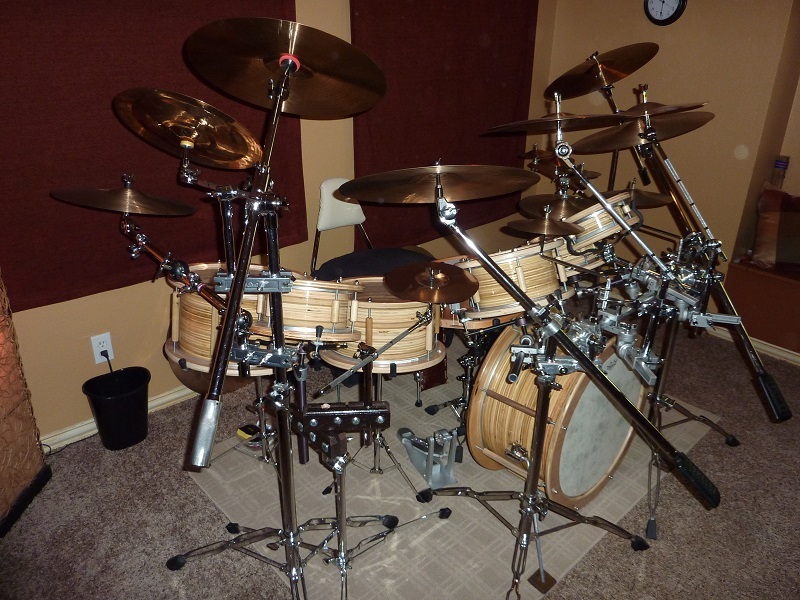 As Phil Collins used to say, If you want loud drums you play concert toms. Nothing is louder. The single-headed drums, even here with just minimal shell to hold a head, are very loud, especially in the small bedroom they are in. Enter Prototype #3. They keep getting bigger to fulfill my liking for pitches and options. 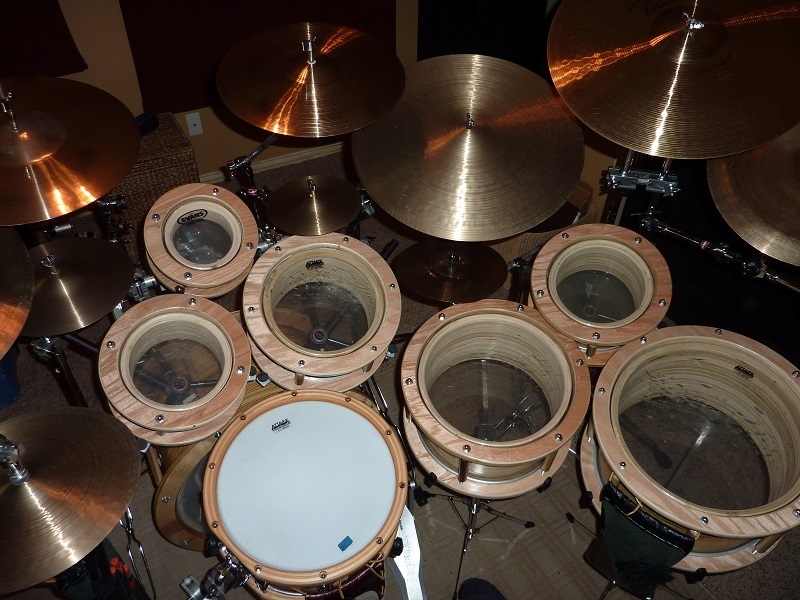 6,8,10,12,14,16,18 toms, 20 kick, and a quirky 10" snare shell with a 13" head over that. This set-up made use of a hole to send the hi-hat through and get me closer to a usual placement. 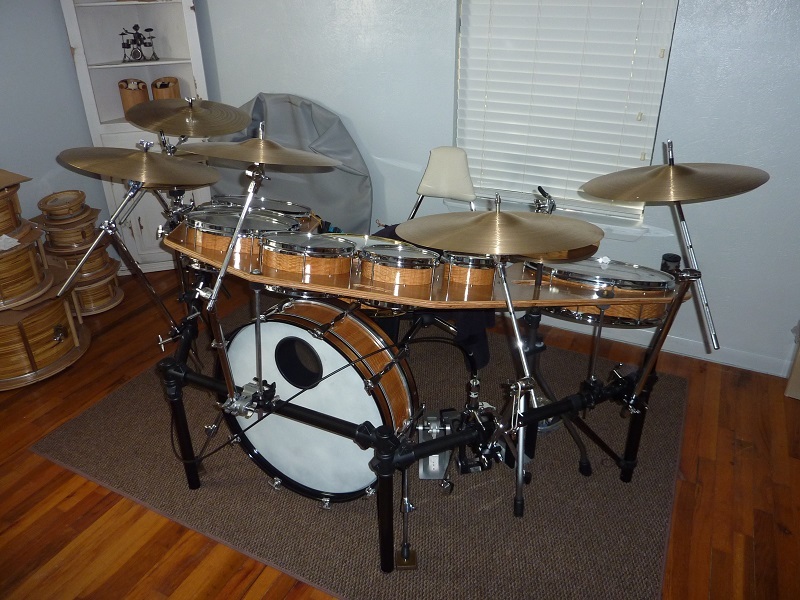 The Stacked Plywood Kit. I had no drum set, got asked to jam with a couple guys, had all this scrap plywood lying around, and tried something I have wanted to do for a couple decades now. 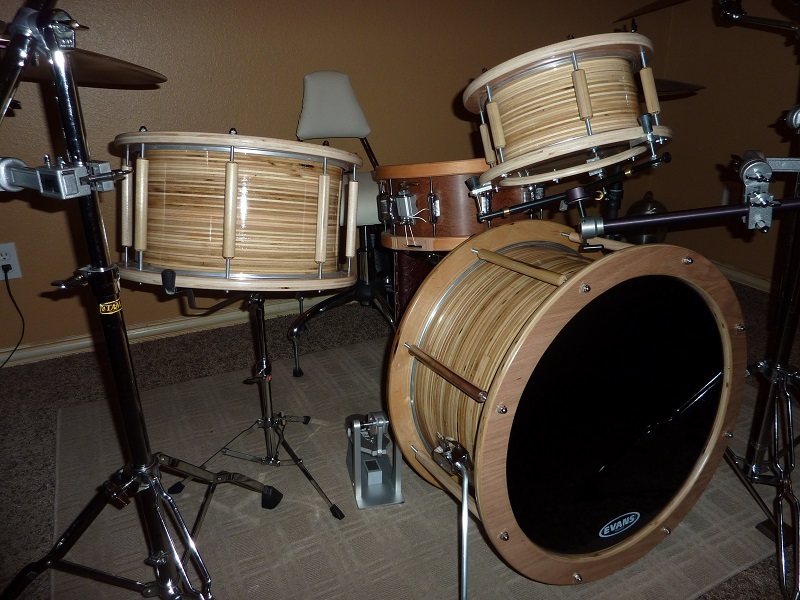 Lugless, duo-tension design, 9/16" thick shells, plywood hoops, 1/4" tension rods w/decorative wood dowels on them. As usual for my regular sets everything mounts in a snare stand - 6x10, 9x15, 12x20, a mathematically aligned kit and as one person noted the drums compliment each other perfectly. I'm not a 4pc player. My imagination cries out for lots of pitches to work with but, that said, this kit is really fun to play. The snare is a segmented 6.5x13 Ironwood (Ipe) shell from Addiction Drum Design w/ Maple hoops from Stellar. Because I don't have a lathe, despite laying out the 3/4" plywood rings as carefully as possible (I have better ideas for that next time around), two days of sanding became the deal to round these things up inside and out. A good four coats of sanding sealer (and I could have used more), a couple coats of Polyurethane, and I called them finished. The trickiest step was drilling through the dowels. I made a jig to hold a drill and pressed the dowels into it. Worked okay. As you can see an Acorn nut sits on the 1/4" threaded rod, passes through the hoop, through the dowel, and into a T-nut in the bottom hoop. Turn the acorn and both heads tension at once, and it works beautifully. They sound great, they look cool, and if I should ever make another big set, forget lugs. This concept is the one I shall refine. If nothing else I have proved my personal conviction a drum, is a drum, is a drum. Two membranes tightened to a cylinder of whatever material. The hype and marketing in this industry is ridiculous. These shells are abominably thick, grains running the wrong direction, not perfectly round, not perfectly plumb, do not have perfect bearing edges as a result ( a lot of Dremel work to even them out), have various typical plywood issues with gaps in plies, etc., yet they sound beautiful. Why? Because the drum head is the sound of a drum, not the shell, which is just a chamber for sound waves to move around in, and density of that chamber is what creates nuances of sound character generally lost in full set play. The 15" tom sustains a note for a good seven seconds. Pray tell, who would hear that in playing the whole set? The sound of a drum is the initial stick impact on the head and the fundamental note of that head(s). The rest is lost in a blur of snare drum, cymbals, and the band. 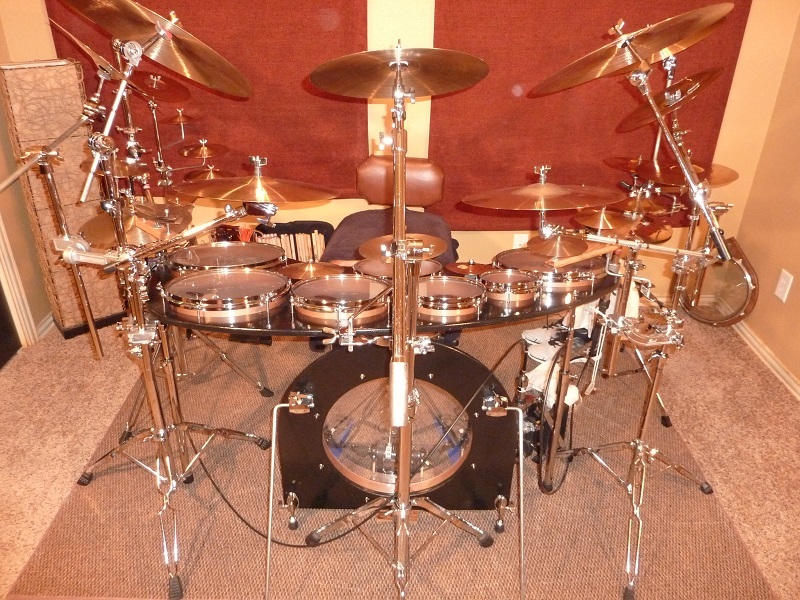 If I had to purchase everything from scratch, and made a snare drum to go with the set, this rig would cost 300-350 max for materials, and whatever mounting hardware you might get if you didn't have any. As far as my time, sure but, that is subjective. I would match its tone to anything out there. The obvious difference is cosmetics. That is subjective, too. I will say, if someone is prone to whacking their hoops these hoops would not take serious punishment with hickory sticks. I'm not a rim-shot tom player. One could use Maple hoops to affix a stationary T-nut to. True, the price would increase, unless you made your own hoops but, you'd still be below the outrageous prices charged for top of the line kits these days. I am making a comment about hype and marketing in the drum industry as it pertains to sound. A drum, is a drum, is a drum. There I stand and can do no other. 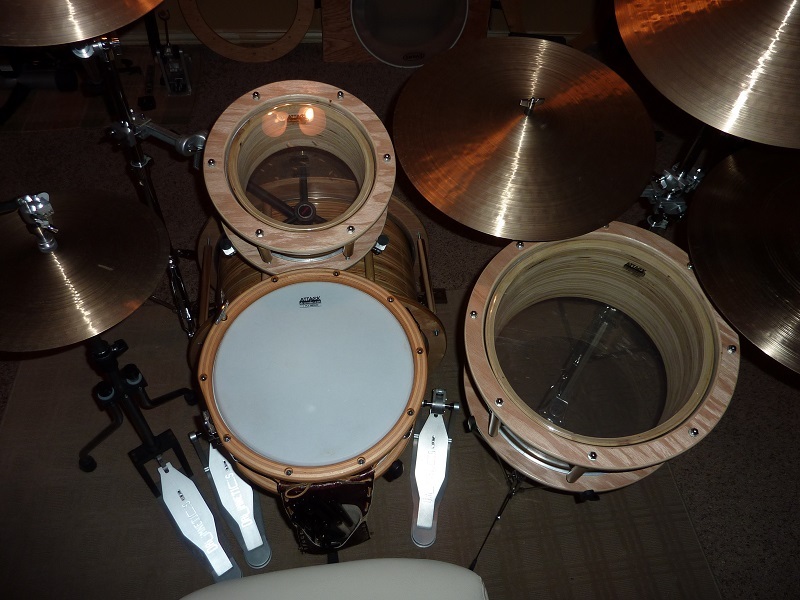 Because I love the sound and had quite a bit of scrap plywood, the Tri-tom set. This rig is different not only in the material but, sizes, as well. A 9" tom. 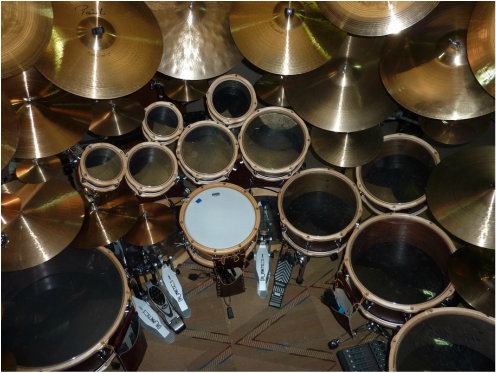 It sits in between the 'floor' toms. 6,8,10 up,9,13,15 down, and the 20" kick. I definitely need to make a snare and see how that works. One of the DIY things visible here is the use of galvanized pipe for clamps instead of typical 1.5" chrome rack pipes. Looks fine and can utilize standard clamp jaw width to secure things. Everything attaches to the pipe which attaches to the two cymbal stands with clamps. Really works well. Of course, all this stuff is "borrowed" from my leather set, still in storage as I write this. Not sure what I'll do when I set the big kit up again. I'd like to develop some kind of hardwood mounting/clamping system. Look closely and see two Oak clamps I made that work great. with the Drumnetics pedals. Plus I added my own magnet assembly on the center section. Very tricky to do but, it seems to be working out nicely so far, despite the frustrations of getting there. The next Pancake/Tabletop prototype. As you can see this has been created with double headed toms and bass. Shells still shallow, and the unit weighs a lot more. It necessitated some cut outs to place my hands to lift it onto the rack. The sound is as good as I could hope for. Needs different heads to give them room to really sing, although the 'floor' toms sound incredible. The Evans G12s, which worked well for single headed drums, are a little too dense and slow for double heads. I need 10 mil batter heads with the resos underneath. The obvious bass drum, departing from a single headed unit, is a 5x24, just a shell pc I had left over from an old project. It fits the theme of the set, sounds great and feels okay, too. The table sits on three rods connected to the rack. If you notice, the small toms have a deeper shell on top and the larger toms have the deeper shell below to give the slight feeling of a typical drum set. The snare drum is an old, converted tom, 6.5x13. It is just floating, no snare stand. I was surprised it sounds as good as it does for the thin shell. With the upper 1" shell and the 3/4" of plywood it essentially ends up being 8.75" deep. Just a few UFIPs to round it out and keep me busy until I can finally get into a place and space to set up the big set once again.